Synopsis: One pill every 7 hours. That could be all it takes to give Chanel the chance to finally see the world around her. Chanel is an independent 19-year-old, despite what her overprotective mother and senator father may think. Being the daughter of a Senator comes with its own problems, one simple afternoon out with friends becomes overwhelming when they’re swarmed by reporters. Keeping the secret of the experimental treatment close to her chest, she is able to fool everyone but her hawkeyed bodyguard, Leon, that has now been assigned to protect her. Chanel doesn’t want a bodyguard, but will she get more than she bargained for? About the Author: Angelina loves dancing with a partner or just by herself. Needlework is another passion of Angelina's. It hurts on the fingers and takes a long time, but once she gets started, it just becomes so much fun. Spending time with her family is great because all of them tend to be really busy. She likes to go exploring for starfish and writing in her journal by the shore. Finally, writing: obviously! Her first published novel is called “Deity’s Soulmate”. Want to read about adventure and romance between goddess and dragon? It’s the book for you! 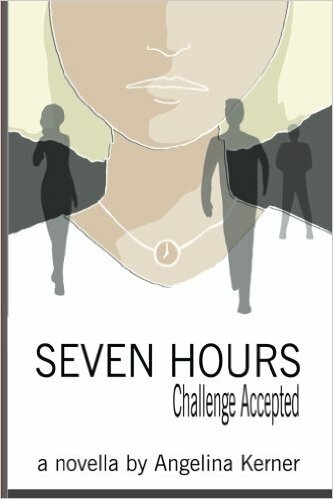 Review: Seven Hours is packed with love, suspense, and the kind of fun that only comes from true friendships. A truly magnificent work that will have you so entranced you won’t want to put it down. A must read.